Malnutrition among young children in Cameroon starts during complementary feeding or the transition period. Last nutritional surveys indicated high prevalence of protein energy malnutrition, iron deficiency anemia and Vitamin A deficiency in children aged 6 to 59 months. No data on appropriate feeding and zinc content in foods are available for this group. 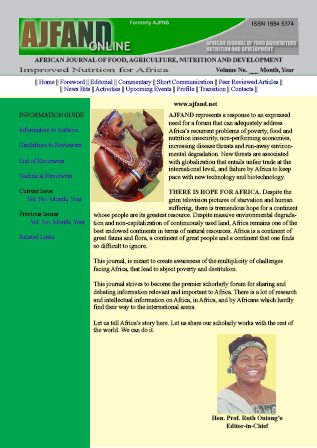 The purpose of this work was to study feeding practices, zinc content and intake of complementary foods in the West Province of Cameroon. One hundred and seventy-two mothers (172) selected from Bangang and Bassessa localities helped to identify the recipes used for preparation of complementary foods. A questionnaire helped to identify and report anthropometric measures of children, the main foods given to them, the cooking methods and the frequency of consumption. Eleven common traditional foods used during the complementary feeding period in these localities were chosen after interviewing mothers with babies under 36 months, cooked in triplicate (three different meals per recipe), as described by mothers, and kept at -20° C for the analyses of their zinc levels and its intakes. The quantities of food eaten by the children were measured by differences of weights of meals at the beginning and at the end of each child feeding. Maternal milk was consumed by 98.8% of babies. Early (43%) and late (49%) complementary feeding were both observed. Total zinc levels were obtained by Atomic Absorption Spectrophotometry and ranged between 0.66 ± 0.05 mg/100 g DW in boiled sweet potato wheneaten with avocado and 2.30 ± 0.34 mg/100 g DW in maize paste (MP) with okra and fish. Zinc intakes estimated from quantities of food consumed comprised between 0.49 ± 0.04 mg/100 g DW in ripe banana to 2.91 ± 0.27 mg/100 g DW in Irish potato cooked with eggs and fresh fish. The maximum combination in three meals could cover only 31% to 67% of the 3 mg and 6 mg recommended daily zinc intakes for children less than 6 months and between 6 and 12 months, respectively. The foods were mainly from vegetal sources and may contain phytates that highly reduce zinc intakes and reabsorption of resecrated zinc in the gastro-intestinal tract. Zinc nutrition is still not well addressed as a public health problem in Cameroon where vitamin A deficiency remains endemic with high prevalences in some regions.